Home › JPhys+ › How do we know LIGO detected gravitational waves? How do we know LIGO detected gravitational waves? One things for sure, the gravitational waves discovery in September 2015 was rather exciting, physicist or not! But how do we actually know for sure that what’s been detected are indeed gravitational waves? Well, CQG+ — the companion website for IOP Publishing journal Classical and Quantum Gravity (CQG) — got talking to researchers from the LIGO detector characterisation group, following publication of their paper in CQG relating to transient noise in the gravitational wave signal, and here’s what they had to say. The practical challenges of characterizing the Advanced LIGO detectors. The Advanced LIGO gravitational wave detectors are extremely sensitive instruments, measuring almost impossibly small changes in length. Their sensitivity is equivalent to measuring a change in distance the thickness of a human hair between Earth and Alpha Centauri, the closest star to Earth. Naturally, such a sensitive measurement picks up background noise in the form of disturbances that pollute the signal. For example, we might expect to see wind gusts, lightning strikes, earthquakes, or four buses full of middle schoolers rolling down the driveway to appear in the data as noise. How then can we be sure LIGO really detected a gravitational wave signal in binary black hole merger GW150914 and not a short-duration burst of noise called a glitch? 2. Then show that it could not be caused by anything except a gravitational wave. The first task belongs primarily to the data analysis groups that search the data for coincident patterns consistent with gravitational waves between the two widely separated detectors. The second half is the centerpiece of this paper. Detector characterization is the boring name for the exciting detective work of tracking down causes of spurious signals in the LIGO detectors. It requires equal parts experience with the LIGO instrumentation, gravitational wave astrophysical analyses, and big-data mining. 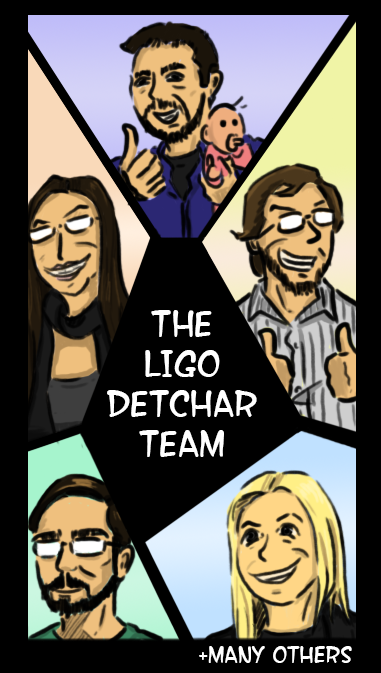 The LIGO Detector characterization group is charged with identifying the types of noise glitches and helping to mitigate them. 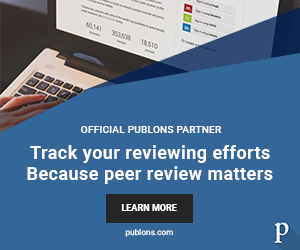 The group is also responsible for vetting the quality of the data. Often the first step in improving data quality is spotting patterns that allow us to sort glitches into classes that likely have a common cause. Without yet knowing the instrumental cause, this pattern-spotting can result in some whimsical names for different glitch types, including ‘Whistles’, ‘Blips’, ‘Koi fish’, and even ‘Fringey the sea monster’. The next step is to find the source of the classified glitches, and as in any good detective story, this requires a mixture of intuition, experience, and solid legwork. One powerful method is to search for correlations between glitches in the gravitational wave output channel of the detector and any of more than 200,000 auxiliary channels. These auxiliary channels include monitors of behavior internal to the detectors as well as a suite of environmental sensors. An example of this process from the recent observation run is the curious case of the 60 Hz glitches at the LIGO-Hanford site. Before the start of the observing run, we noticed glitches at 60 Hz in LIGO-Hanford’s data that occurred about once an hour. We also saw coincident glitches in magnetometers at the end of one of the arms of the interferometer. During the summer, the time between these glitches was a little less than an hour. As the weather became cooler during autumn, the time between glitches grew to over an hour, suggesting a temperature-related cause. 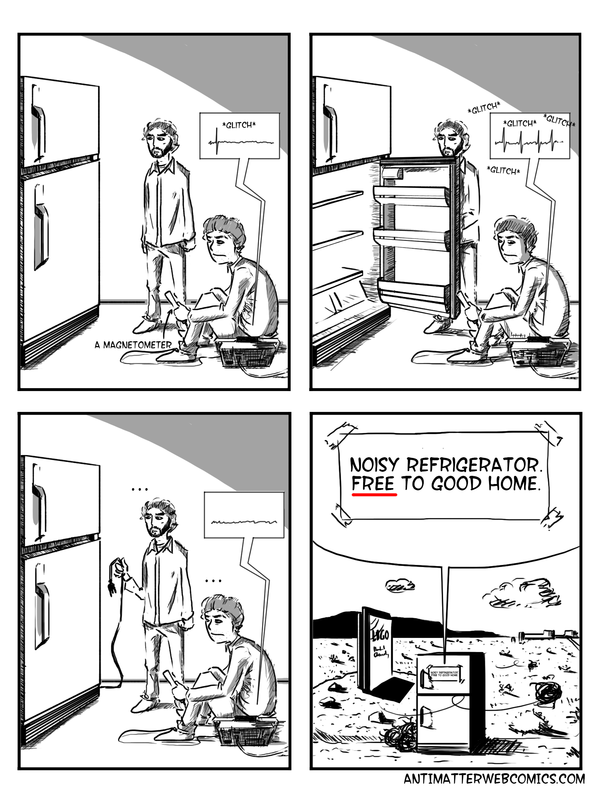 Using handheld magnetometers, the culprit was identified as a refrigerator. Whenever the fridge compressor switched on, it would draw a burst of power that coupled into the electronics of the instrument. The glitches disappeared after the refrigerator was unplugged. (No refrigerators were harmed in the making of this discovery). Another practical challenge is understanding how well we can measure the effect of the environment on the data. This relies on a network of environmental sensors such as seismometers, accelerometers, microphones, radio antennae, and magnetometers that are installed around each of the two detectors. We perform injection tests where we induce an artificial environment noise, like an oscillating magnetic field, and measure the response of the detector data as well as the sensor network. 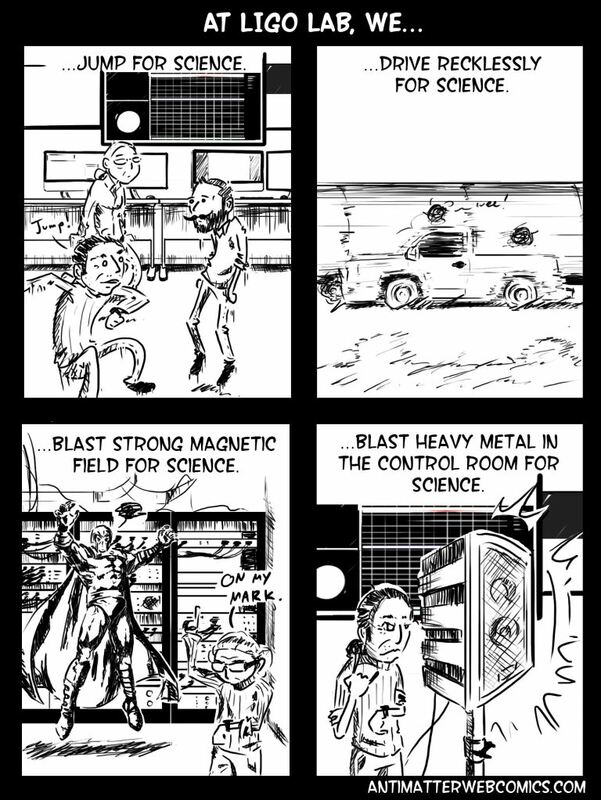 Sometimes this is done with equipment like a magnetic field generator, but sometimes simulating realistic anthropogenic noise comes down to a bunch of scientists jumping up and down, or dropping heavy objects. 1) GW150914 is by far the loudest event in all searches for short-duration gravitational wave signals coincident between the two LIGO detectors; a clear outlier relative to the background noise. 2) At the time of the event, there were no environmental or internally generated sources of noise that could have caused it. To find out more about noise characterization related to GW150914, check out the LIGO Scientific Collaboration’s paper in Classical and Quantum Gravity. This post was originally published on CQG+ on 6 June 2016 at CQG+: How do we know LIGO detected gravitational waves?